Beersheba (Hebrew: בְּאֵר שֶׁבַע‎, Be'er Sheva, Turkish: Birüssebi) is the largest city in the Negev desert of southern Israel, often referred to as the "Capital of the Negev." In the Bible, water-rich Beersheba was once the home of each of the major Hebrew patriarchs, Abraham, Isaac, and Jacob. It was later an important Israelite religious center until the destruction of its altar and the removal of its priests under the centralizing reforms of King Josiah in the seventh century B.C.E. Beersheba languished thereafter for more than two millennia, but revived somewhat in the late Ottoman Empire and became an important battleground during World War I and the Israeli War of Independence, in 1948. It has grown considerably since the founding of the Jewish state. A large portion of the population is made up of Jews who immigrated to Israel from Arab countries after 1948, and newcomers from Ethiopia and the former Soviet Union. Beersheba has faced challenges for many years due to political problems, poor financial planning, and the workforce from apathy. However, in 2005, when the population reached 185,000, it became the sixth largest city in Israel. Located in the Southern District of the country and acting as its administrative center, and Beersheba houses Ben-Gurion University of the Negev and the Soroka Medical Center, as well as several cultural, research, and sports facilities. 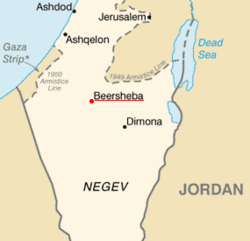 Location of Beersheba in modern Israel. Dry river bed in Natal Ashan park. Beersheba's water supply in the midst of an arid desert made it an attractive population center. Beersheba is located on the northern edge of the Negev desert 115 km south-east of Tel Aviv and 120 km south-west of Jerusalem. The Valley of Beer Sheva has been populated for thousands of years, due to the presence of water which travels from the Hebron Mountains in the winter and is stored underground in vast quantities. The main river in Beersheba is the Beersheba Stream, a wadi which floods in the winter. The Kovshim and Katef streams are other important wadis which pass through the city. Be'er is the Hebrew word for well; sheva could mean either "seven" or "oath" (from the Hebrew word shvu'a). The seven ewes that sealed Abraham and Abimelech's oath (well of the seven). From findings unearthed at Tel Be'er Sheva, an archaeological site a few kilometers northeast of modern day Beersheba, it is believed that the region has been populated since the fourth millennium B.C.E. The city was destroyed and rebuilt many times over the centuries. Water played a major role in the city's importance. Israelite altar at Beersheba, reconstructed from fragments of the original, which was probably destroyed by King Josiah in the seventh century B.C.E. 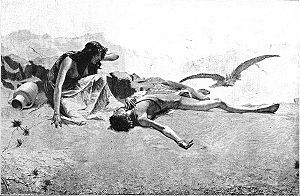 In the Bible, the desert near Beersheba was the site of Hagar's banishment with Ishmael, where they almost died of thirst before an angel showed them a hidden well (Gen. 21:14). Beersheba was the site of a non-aggression pact between the Philistines, represented by king Abimelech, and the patriarch Abraham, instituted after a dispute over water rights. (The story may be anachronistic, as most modern scholars believe the Philistines did not arrive in the area until several hundred years later.) The site became sacred to the Israelites, as Abraham is said to have planted a tamarisk tree there, "and there he called upon the name of the Lord, the Eternal God" (Genesis 21:33). The area became one of Abraham's permanent dwelling places, where he lived at the time of his offering of Isaac. An alternate tradition, (Genesis 26) makes Isaac the one who makes a pact with Abimelech at the site, which he named Shibah, a word related both to "oath" and "seven," as in seven wells. Both Sarah and Rebekah are said to have been taken into Abimelech's harem during their husbands' stays in the region. The two stories are thought by critical scholars to represent alternative sources, the Isaac story being from the southern, or "Yahwist" source, and the Abraham story being from the northern "Elohist" tradition. Isaac apparently remained at Beersheba and raised his family there, and it was from Beersheba that Jacob fled from his brother Esau, stopping first at Bethel on his way northeast to Haran. A generation later, when Jacob and his tribe emigrated to Egypt, he stopped at Beersheba on the way, where he "offered sacrifices to the God of his father Isaac" (Gen. 46:1) and received a vision from God confirming the correctness of his course. Beersheba was considered to be the southernmost city of Israel in the period of the Kingdom of the judges; hence the expression "from Dan to Beersheba" was often used to describe the extent of Israelite territory. 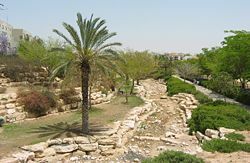 The prominence of Beersheba in the stories of the patriarchs led biblical scholars to believe that it was the site of an important Israelite religious center in later generations, as were Bethel, Gilgal, and other sites (Amos 5:5). A recently rediscovered Israelite stone altar at Beersheba has now confirmed this. However, after the Temple of Jerusalem was established, these sites came into disfavor in the biblical histories and the writing of one prophet (Amos 8:8). The ancient altar at Beersheba was thus destroyed by King Josiah of Judah in the late seventh century B.C.E., on the grounds that it was no longer authorized, since sacrifices to the Israelite God could only be properly offered in Jerusalem. Beersheba's priests were brought to the capital but were not allowed to serve at Jerusalem's altar, apparently given less prestigious duties among their fellow priests there (2 Kings 23:8-9). After this period, Beersheba disappears from the biblical record. The last inhabitants of Tel Be'er-Sheva were the Byzantines, who abandoned the city in the seventh century. The Ottoman Empire, which had controlled Palestine since the sixteenth century]], took no interest in Beersheba until the end of the nineteenth century. In the early 1800s, Beersheba was portrayed by European pilgrims as a barren stretch of land with a well and a handful of Bedouins living nearby. Toward the end of the nineteenth century, the Ottomans built a police station in Beersheba in order to keep the Bedouins in check. They built roads and a number of small buildings from local materials, some of which are still standing today. A town plan was created by European architects, which called for a grid street pattern, a pattern which can still be seen today in Beersheba's Old City. All houses built during that period were of one story, and the two-story police station towered above them. Most of the city's residents were Arabs from Hebron and the Gaza area, although a slew of Bedouins abandoned their nomadic lives and built homes in Beersheba. During World War I, the Turks built a military railroad from the Hejaz line to Beersheba, inaugurating the station on October 30, 1915. The celebration was attended by the Turkish army commander Jamal Pasha, along with senior government officials. The train line was active until the British took over the region. Later, during Israel's war of independence, the station was used as the headquarters of the Egyptian Army. The charge of the 4th Light Horse Brigade, re-enacted on its ninetieth anniversary, October 31, 2007. 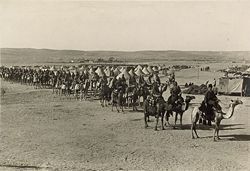 Beersheba played an important role in the Sinai and Palestine Campaign in World War I. On October 31, 1917, 800 soldiers of the Australian 4th and Light Horse Brigade, under Brigadier General William Grant, with only horses and bayonets, charged the Turkish trenches, overran them, and captured the wells of Beersheba. This is often described as the Battle of Beersheba, and the last successful cavalry charge in British military history. On the edge of Beersheba's Old City is a Commonwealth cemetery containing the graves of British and Australian soldiers. Beersheba was a major administrative center during the period of the British Mandate for Palestine. In 1928, at the beginning of the tension between the Jews and the Arabs over Palestine and wide-scale rioting which left 133 Jews dead and 339 wounded, many Jews abandoned Beersheba, although some returned occasionally. With the Arab attack on a Jewish local bus, in 1936, which escalated into the 1936–1939 Arab revolt in Palestine, the remaining Jews left Beersheba and did not return until after the battle with the invading Egyptian army in October 1948. The 1947 UN Partition Plan included Beersheba in the territory allotted to the Arab state as the city's population of 4,000 was primarily Arab. The Egyptian Army was stationed in Beersheba in May 1948. Convinced that Beersheba was vital for the security of the Jewish state, Prime Minister David Ben-Gurion gave the green light for Operation Yoav. 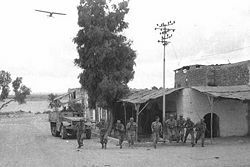 On October 21, 1948, at 4:00 a.m., the 82nd battalion advanced from Mishmar Hanegev junction, 20 kilometers north of Beersheba. By 09:45, the Egyptian forces were surrounded, and Beersheba was in Israeli hands. A month later, Leonard Bernstein and the Israel Philharmonic Orchestra gave a concert for the Israeli soldiers and others in the city. In the 1950s, Beersheba expanded northward. Soroka hospital opened its doors in 1960, and the Negev University, later renamed Ben-Gurion University of the Negev, was established in 1970. In the 1970s, a memorial commemorating the fallen soldiers designed by the sculptor Dani Karavan was erected on a hill northeast of the city. The Beersheba Theater opened in 1973, and Egyptian president Anwar Sadat visited Beersheba in 1979. In the 1990s, the population and size of Beersheba was substantially increased by a large influx of Russian and Ethiopian immigrants. For many years, Beersheba remained untouched by Palestinian terrorism. Relations between Jews and Arabs, and especially the large number of Bedouins who live in the region and do business in Beersheba, were good. This equilibrium was shattered on August 31, 2004, when 16 people were killed in two suicide bombings on buses in Beersheba, for which Hamas claimed responsibility. On August 28, 2005, another suicide bomber attacked the central bus station, seriously injuring two security guards and 45 bystanders. Beersheba has very hot summers, with temperatures up to 42 °C (110 °F). In the winter, the temperature at night can be as low as 0 °C (30 °F). The average precipitation in the city is 260 mm a year. Between summer to winter, Beersheba is prone to sandstorms that cover the whole city in dust. About 200-250 tonnes/sqkm of dust are dumped in the area. Fog and humidity at night are also unique to Beersheba and the Negev region, occurring for some 50 percent of nights a year and being caused by wet air coming from the sea being trapped under hot, dry air above. The relative humidity in the city reaches 86 percent through much of August. Beersheba is divided into 17 residential neighborhoods in addition to the Old City and Ramot. Many of the neighborhoods are named after letters of the Hebrew alphabet, which also have numerical value, but descriptive place names have been given to some of the newer neighborhoods. The city also has three main industrial zones: Makhteshim, Emek Sara, and Kiryat Yehudit, all located in the southeast of the city. An additional light industrial zone is located between Kiryat Yehudit and the Old City. The tallest buildings in the city are the two towers of the Rambam Square complex. Rambam Square 2 is the tallest apartment building in Israel outside of the Gush Dan Tel Aviv Metropolitan Area. According to Israel's Central Bureau of Statistics (CBS), Beersheba had a population of 185,400 by the end of 2006, compared to 110,800 in a survey conducted 20 years earlier. This makes Beersheba the sixth largest city in Israel. In 2001, the ethnic makeup of the city was 98.9 percent Jewish and other non-Arab, with no significant Arab population (see Population groups in Israel). There were 86,500 males and 91,400 females living in Beersheba. The population breakdown by age was 31.8 percent for 19 year olds or younger, 17.4 percent for 20-29 year olds, 19.6 percent for 30-44 year olds, 15.8 percent for 45-59 year olds, 4.0 percent for 60-64 year olds, and 11.4 percent for 65 years of age or older. The population growth rate in 2001 was 2.9 percent. Many people live in Beersheba for short periods of time, for example, while studying at the university or working at the nearby army bases. In 1982, when Israel evacuated a major portion of the Jewish community of Ethiopia, a large number of this community was settled in Beersheba. There are now approximately 10,000 Ethiopian Israelis living in Beersheba, with their own community center built in the Yud Aleph Quarter of the city. To remind the new citizens of the villages they left behind, the roof of the community center is a conic shape, much like their old homes. 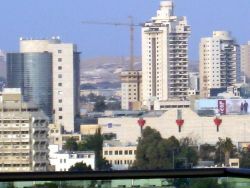 The largest employers in Beersheba are the municipality itself, Israel Defense Forces, Ben-Gurion University, and the Soroka Medical Center. There are also a number of electronics and chemical plants, including Teva Pharmaceutical Industries, in and around the city. A large high-tech park is also being built near the Beersheba North Railway Station. Three main industrial zones exist in the city proper, as well as a high-tech zone in adjacent Omer. A major Israel Aerospace Industries complex is located in the main industrial zone, north of Highway 60. According to CBS figures, Beersheba had 61,016 salaried workers and 3,010 self-employed citizens in 2000. Salaried workers earned an average monthly wage of NIS 5,223. Men earned an average monthly wage of NIS 6,661 (a real change of 5.2 percent) compared to NIS 3,760 for females (a real change of 3.9%). Self-employed persons had an average income of NIS 6,533. A total of 4,719 persons received unemployment benefits, and 26,469 persons received income supplements of various types. The Beersheba municipality was plagued for many years by an ineffectual leadership, political problems and poor financial planning. In the last few years, the situation has improved slightly but has been hampered by a workforce suffering from apathy. Since 2005, attention has been focused on developing parks and infrastructure. A new youth center opened in 2005, and a new cultural center opened in 2007. Parts of the Old City are being renovated, and after many years of financial struggle, the municipality has achieved a balanced budget. The official emblem of the municipality of "Be'er Sheva" depicts a tamarisk tree, the tree that Abraham planted at the site (Genesis 21:33), and the observation tower connected to the municipality building. In 2006, Beersheba had 81 schools and a student population of 33,623: 60 elementary schools with an enrollment of 17,211, and 39 high schools with an enrollment of 16,412. Of Beersheba's 12th graders, 52.7 percent earned a matriculation certificate in 2001. The city also has several private schools and Yeshivot which cater to the religious sector. In terms of higher education, Beersheba is home to one of Israel's major universities, Ben-Gurion University of the Negev, which is located on an urban campus in the city. Several local colleges also operate in the city, including the Kaye Academic College of Education, the Sami Shamoon Academic College of Engineering, and the Practical Engineering College of Beersheba. Also in the city is a Government college (מגללה למנהל), a technical college, and an art and performance college. Furthermore, the Israeli Airforce (Techni) is located in the city. The two most popular sports in Beersheba are soccer and freestyle wrestling. The largest soccer club in the city is Hapoel Be'er Sheva which is currently represented in Israel's second tier football league. Formed in 1949, the team has a history of two league championships (1975 and 1976), one national cup (1997), and two Toto cups (1989 and 1996). The local stadium is the Vasermil Stadium with a capacity of 14,000, shared by Hapoel and the city's lesser known club Maccabi Be'er Sheva. Another soccer team in the city is Beitar Be'er sheva. Beersheba also has the second biggest wrestling center (AMI wrestling school) in Israel. The center has approximately 2000 students, most of whom are from Russian immigrant families. Maccabi Be'er Sheva has a freestyle wrestling team, while Hapoel Be'er Sheva has a Greek-Romi wrestling team. Beersheba is also Israel's leading chess center. The local chess club has won many cups and national championships. It represented Israel in the European Cup and hosted the World teams championship in 2005. The chess club was founded in 1973, by Eliyahu Levant, who is still the driving spirit behind this club. Beersheba has a higher percentage of grandmasters than any other city worldwide with eight, many of whom are immigrants from the former Soviet Union; the city of 185,500 has one grandmaster per 23,188 residents. Cricket (introduced by the British in the 1960s) is played in the city under the auspices of the Israeli Cricket Association while the city is also home to the Camels-ASA Beersheba rugby team, whose senior and youth squads have won several national titles. Tennis and gliding are also popular sports. Beersheba's tennis center, which opened in 1991, features eight lighted courts, and the Be'er Sheva (Teyman) airfield is used for gliding. Beersheba is the central transportation hub of southern Israel, served by roads, railways, and air. Its central bus/train station area is one of the most crowded terminals in the country. The city is also served by the Tayman (Yemen) Airfield. Beersheba is connected to Tel Aviv via Highway 40, the second longest highway in Israel, which passes to the east of the city. From west to east, the city is divided by Highway 25, connected it with Ashkelon and the Gaza Strip to the northwest, and Dimona to the east. Finally, Highway 60 connects Beersheba with Jerusalem and the Shoket Junction, and goes through the Palestinian Territories. On the local level, a partial ring road surrounds the city from the north and east, and Road 406 (Reger Blvd.) goes through the city center from north to south. 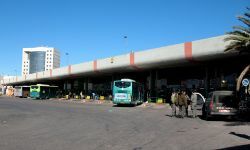 Metrodan Beersheba, established in 2003, has a fleet of 90 buses and operates 19 lines in the city, most of which depart from the Beersheba Central Bus Station. These lines were formerly operated by the Egged Bus Cooperative. Inter-city buses to and from Beersheba are operated by Egged, Egged Ta'avura and the Metropoline company. 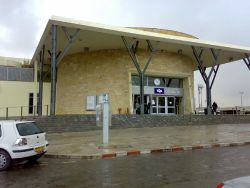 Israel Railways operates two stations in Beersheba: Be'er Sheva North and Be'er Sheva Central railway station, on the old Railway to Beersheba. Between the two stations, the railway splits into two, and also continues to Dimona and the Dead Sea factories. An extension is planned to Eilat (the southern most city in Israel) and Arad. The railway line to Beersheba uses the slow single-track configuration, and is being converted to dual-track, a project expected to end in late 2009 and will significantly decrease travel time from Tel Aviv and Haifa to Beersheba, at a cost of NIS 1,885 million. ↑ Israel Central Bureau of Statistics, Table 3: Population of Localities Numbering Above 1,000 Residents and Other Rural Population, 12.31.2007, www.cbs.gov.il. Retrieved September 19, 2008. Shanks, Hershel, and Dan P. Cole. Early Israel. Washington, D.C.: Biblical Archaeology Society, 1990. ISBN 978-0961308957. This page was last modified on 31 May 2016, at 20:26.